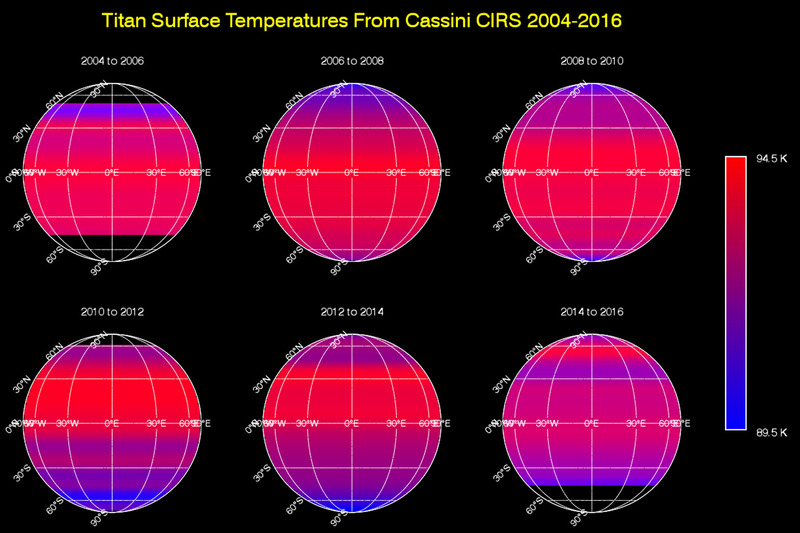 February 23, 2016 – This sequence of maps shows varying surface temperatures on Saturn’s moon Titan at two-year intervals, from 2004 to 2016. The measurements were made by the Composite Infrared Spectrometer (CIRS) instrument on NASA’s Cassini spacecraft. The maps show thermal infrared radiation (heat) coming from Titan’s surface at a wavelength of 19 microns, a spectral window at which the moon’s otherwise opaque atmosphere is mostly transparent. Temperatures have been averaged around the globe from east to west (longitudinally) to emphasize the seasonal variation across latitudes (from north to south). Black regions in the maps are areas for which there was no data. Titan’s surface temperature changes slowly over the course of the Saturn system’s long seasons, which each last seven and a half years. As on Earth, the amount of sunlight received at each latitude varies as the sun’s illumination moves northward or southward over the course of the 30-year-long Saturnian year. When Cassini arrived at Saturn in 2004, Titan’s southern hemisphere was in late summer and was therefore the warmest region. Shortly after the 2009 equinox, in 2010, temperatures were symmetrical across the northern and southern hemispheres, mimicking the distribution observed by Voyager 1 in 1980 (one Titan year earlier). Temperatures subsequently cooled in the south and rose in the north, as southern winter approached. While the overall trend in the temperature shift is clearly evident in these maps, there is narrow banding in several places that is an artifact of making the observations through Titan’s atmosphere. The moon’s dense, hazy envelope adds noise to the difficult measurement. The animation above shows a simplified model of the varying temperature data at yearly intervals. The latitude banding has been smoothed to more clearly show the how Titan’s peak temperature moves from 19 degrees south to 16 degrees north latitude between 2004 and 2016. The small globe in the upper right corner shows the view of Titan as seen from the direction of the sun. The latitude on Titan where the sun is directly overhead (the subsolar latitude) is indicated by a yellow star. Although it moves in latitude, the maximum measured temperature on Titan remains around -292 degrees Fahrenheit (-179.6 degrees Celsius, 93.6 Kelvin), with a minimum temperature at the winter pole only 6 degrees Fahrenheit (3.5 degrees Celsius or Kelvin) colder. This is a much smaller contrast than exists between Earth’s warmest and coldest temperatures, which can vary by more than 200 degrees Fahrenheit, or more than 100 degrees Celsius. These Titan surface temperature maps are a visualization of measurements that appeared in publication as: D. E. Jennings et al., Astrophysical Journal Letters, 816, L17, 2016, http://dx.doi.org/10.3847/2041-8205/816/1/L17. The Cassini-Huygens mission is a cooperative project of NASA, the European Space Agency and the Italian Space Agency. The Jet Propulsion Laboratory, a division of the California Institute of Technology in Pasadena, manages the mission for NASA’s Science Mission Directorate, Washington, D.C. The Cassini orbiter was designed, developed and assembled at JPL. The composite infrared spectrometer team is based at NASA’s Goddard Space Flight Center, Greenbelt, Maryland, where the instrument was built. The imaging operations center for Cassini is based at the Space Science Institute in Boulder, Colorado.